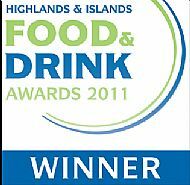 This range won the Highlands and Islands Healthier Food and Drink award 2011. 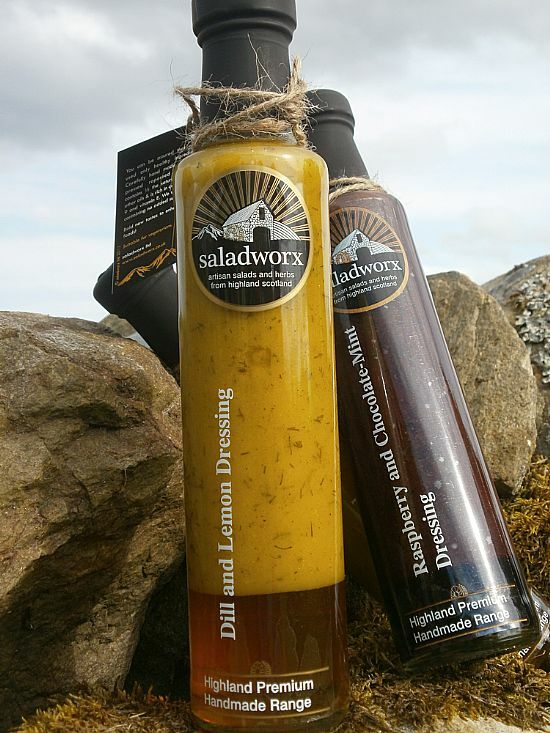 These dressings can be used as marinades as well as to drizzle. 100% natural, made with Scottish cold pressed rapeseed oil and sulphite-free vinegar. 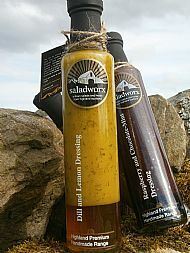 In 2014 we won the 'Great taste' award for our Heather Honey & Arran Mustard dressing (pictures and prices below; items 3&4). Our original range of dressings/marinades/drizzles was inspired by what we were growing on the farm and in the garden and what grew locally. 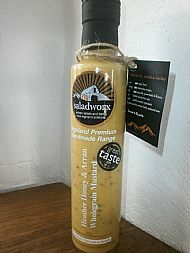 We wanted healthy, tasty dressings which were good enough for our fantastic salad! 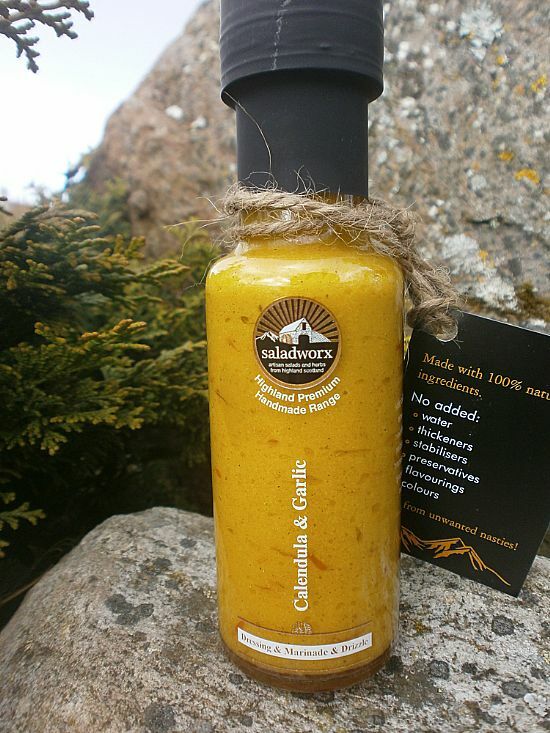 This range benefits from fresh herbs and lovely fruit juices. 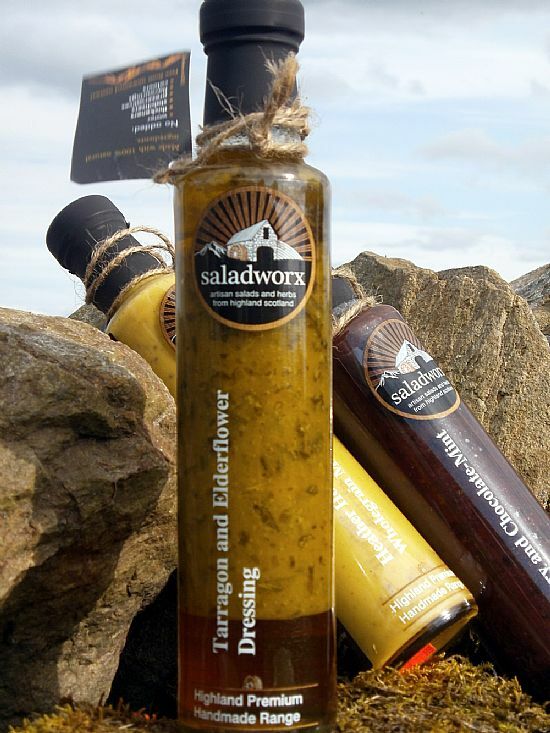 We use our own herbs where possible which are naturally grown and free from chemical residues. 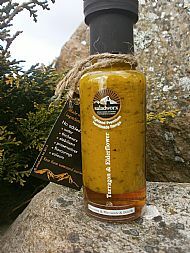 We only use the finest additive free mustards, heather honey from the local hills, Scottish cold pressed rapeseed oil, sulphite-free vinegars and natural fruit juices. Hand made in small batches on our farm. Vegetarian. Vegan (except for the heather honey contained in our Heather Honey & Arran Wholegrain Mustard). Gluten-free. Additive-free. A little dressing on your salad increases the bodies ability to absorb important nutrients. Inspired by what we grow on the farm and hand made in small batches, naturally sweet and delicate elderflower infusion is complemented by tarragon. This dressing is super with bitter leaves like endive and radicchio, a great accompaniment to chicken and perfect as a dip. 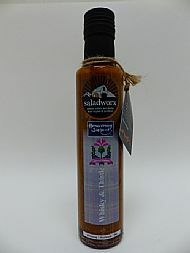 A truly Scottish twist on an old favourite! 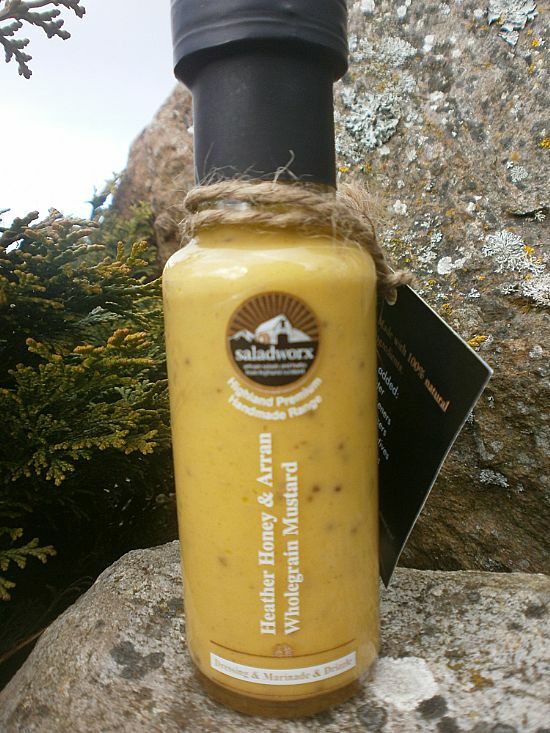 Delicious and probably the best honey and mustard dressing you will ever taste. 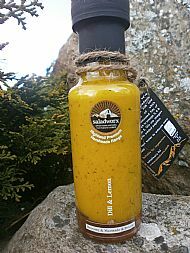 Hand made with all heather honey from the local hills and a super wholegrain mustard, this dressing is extremely flavoursome and well balanced. Great with British bangers, cheeses, chicken, potatoes, and of course salad. Using dill grown on the farm wherever possible and fresh, zesty lemon juice, this dressing is proving a hit with salmon and other fish dishes. Perfect with salad and for roasting. 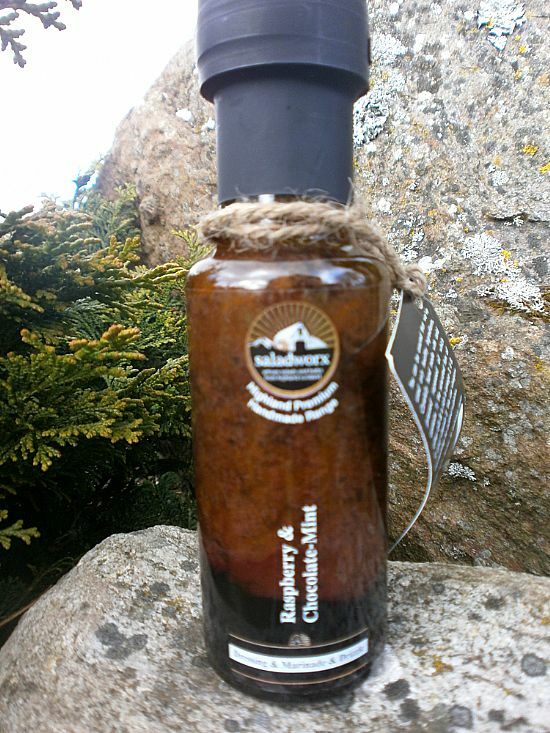 Hand made in small batches on our farm, 100% natural. A must have! We may rename this one Mint and Raspberry, but whatever we call it, it is full of surprises. 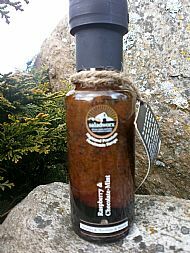 It is packed with raspberry juice which provides a surprisingly savoury taste, combined with the herby mint flavours following later. Jakeline O’Donnel from the Sisters Restaurant in Glasgow uses this dressing with venison. 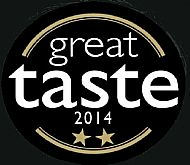 Perfect with lamb, steak and a fantastic salad. 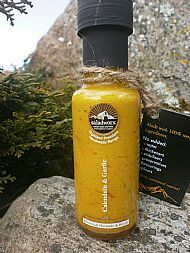 Another unique combination, using our own farm grown calendula petals, together with garlic. It is super with salad and potatoes, providing a really colourful, interesting dressing. 100% natural, in small batches. Originally to celebrate Scotland’s Homecoming 2014. 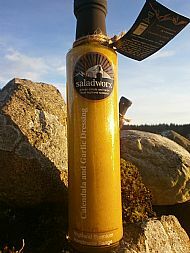 This is a truly unique product, bringing together in a sauce, what Scotland is internationally renowned for fine Single Malt Scottish Whisky and natural Thistle plant. 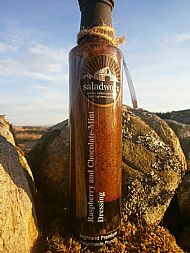 A perfect accompaniment to salads, haggis, cheeses, meats.